Save the Date & Celebrate! Have you ever dreamed of drawing Owls, Hawks and Golden Eagles? Now is your chance with live models! 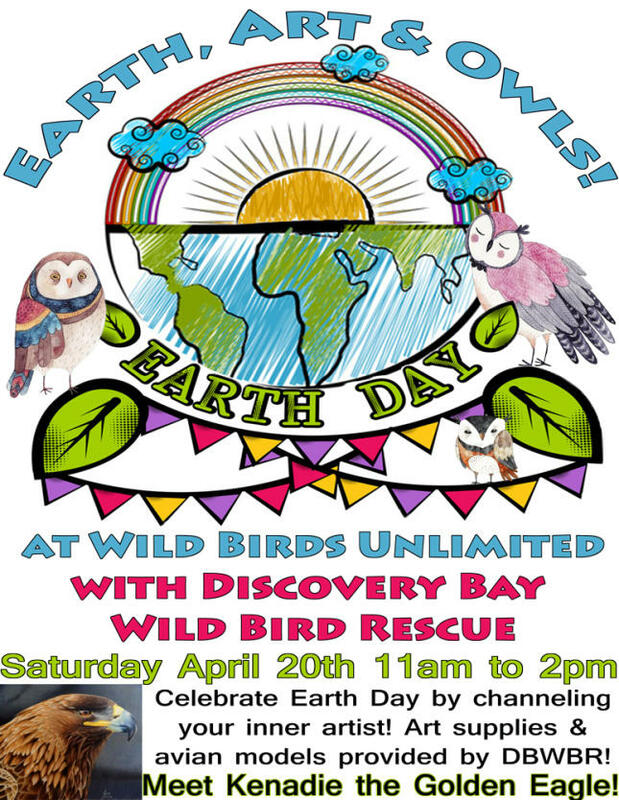 Meet the Educational Birds of Prey from Discovery Bay Wild Bird Rescue Saturday April 20th from 11am to 2pm in the Gardens of Wild Birds Unlimited in Gardiner. Discovery Bay Wild Bird Rescue will provide Live Birds for inspiration, colored pencils, crayons and paper for all budding artists who wish to capture the majestic spirit of these gorgeous birds on paper. More serious artists are welcome to bring their own plein air supplies and enjoy this opportunity to create a new masterpiece! This event will be the Grand Public Debut of DBWBR’s rescued Golden Eagle, Kenadie, whose gentile spirit and amazing beauty will inspire the artist in all of us! While you are here learn all about our local Wild Bird rehabbers, their amazing Rescue Center and the tremendous amount of work they do to save our wild bird population. Please consider bringing a donation for this amazing organization. Their motto is Save a Bird; Save the World! The Dungeness River Audubon Center. Traditional Native Flute Music by The Wind People. Native Plant Sale with Eagle Creek Native Plant Nursery. & MariePaul's Authentic Belgian Waffles - $5 each and $1 from every waffle sold goes to DBWBR!